Everything I just told you is fact. And while I’d love to share some facts from my life surrounding this epic event, I was not yet born. Therefore I have pestered my colleagues into sharing their personal stories and memories of this momentous day. When Mount St. Helens erupted, I was in Victoria, B.C. with my high school marching band, getting ready to perform in the Victoria Days parade. I think we didn’t find out about the event until returning home, which was in Des Moines (WA, not IA). There wasn’t much evidence of the explosion in my neighborhood, but the following September I headed to Walla Walla for my first year of college, and ash was still quite prevalent in that area. And to bring things full circle, we put together a very small marching band for our soccer homecoming game, and the other trumpet player (to be silly) wore a surgical mask (which were recommended after the blow up) while marching. It was a beautiful sunny spring day. My mother and I were in church at Saint Mary Magdalene’s. Because it was such a warm lovely day, the church doors were propped open. Suddenly there was a loud Ka-Boom! We thought it was probably a sonic boom. When we returned home we discovered that Mount St. Helens had exploded. I don’t know why we didn’t think it was the volcano right away when we heard the explosion. The bulge in the mountain was on the news every night, as well as the many interviews with Harry Truman at Spirit Lake Lodge. You might think the explosion of a volcano would leave a large impression on a young man, but sadly the eruption of Mount St. Helens was just a news headline for me in 1980 as I prepared to enter junior high school in the wilds of Wisconsin. Bouncing around in my self-absorbed pre-adolescent mind were songs like “Cars” by Gary Numen or “Refugee” by Tom Petty and the Heartbreakers with little room left for significant geological and national news events. 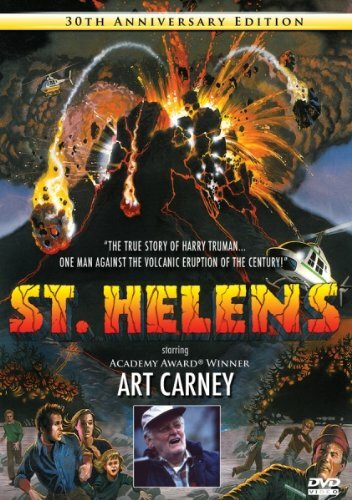 Oddly though, I do remember a rather dreadful direct-to-cable movie that came out a year or two after the event titled, St. Helens. It was your classic, and cheesy, disaster movie starring Art Carney as Harry Randall Truman, the lodge owner who refused to leave despite ample warning that the mountain was going to blow. I remember that it was a Sunday and my fiancée (now husband of almost 25 years) and I were headed into an opera at the Seattle Center. It was Wagner, I believe. We saw an ash plume when we emerged. What’s that? It took a while to find out since in those days we didn’t have a mobile phone, of course. We had to go home and wait for the 5 o’clock news to find out that a volcano had erupted. My memory of that day is similar to thousands of others…I was working in the backyard in my north Everett home, and my 5-month-old baby was napping in the house. Suddenly I heard what I thought was the loudest sonic boom I’d ever heard! (I just knew that’s what it was because I’d grown up in Eastern Washington, where we heard these things all the time.) It rattled the windows and really shook me up. I thought those military planes weren’t supposed to fly that low! Boy, was I stunned over the next few days; every time we turned on the TV we saw more our state being choked with ash – ash that eventually made its way around the world. It was so sad, mostly for cities to the northeast of the mountain, and for mountain resident Harry Truman, who’d been interviewed repeatedly since the mountain started rumbling, and who refused to leave his home. It was a Sunday, middle of the afternoon and my mother was driving us kids back home to Colfax from Spokane. The sky got really dark, like it was going to storm…and boy did it rain down this silvery white ash like snow. Our car, a little Corvair, choked on all the ash in the air filter and broke down. Luckily, the high school principal was just a few cars back and gave us a ride back to town in his big Suburban. When we got home, we had students from WSU camped out in our living room because they couldn’t get back to school. We ended up with over a foot of ash…we cleared it off the roof and sidewalks with snow shovels. I was in eighth grade at the time and the spring quarter ended then, on that day…Yippee, early summer vacation! The town where I grew up was in the Palouse, famous for our wheat fields and other agricultural products. Everyone was worried what the ash would do to the crops; in the end, it didn’t hurt them, and may have even fertilized them some. I remember we all had to wear these ash masks when we went outside. At first they were afraid that the fallout might hurt us (possible radiation or contamination), but when it didn’t, they let us kids play in the muck just like we played in snow. It was scary at the time but fascinating to watch on television. The weekend Mount St. Helens erupted my best friend had come up from Longview to visit me in Seattle. She got a phone call from her parents telling her the mountain had erupted and she should come right home before the road was cut off. All predictions were expecting the I-5 Bridge to go once the massive flow of debris on the Toutle River met the Cowlitz River. I was immediately frightened for my Grandma; she lived in Kelso just five blocks from the Cowlitz River and her neighborhood was right at river level. The quick action of evacuation efforts got them out of potential harm’s way. I had a number of other friends and relatives in that area, and in the path of the heaviest ash fallout; thankfully the only harm suffered was to their vehicles. I had been on an outing to Mount St. Helens and Spirit Lake just a few years before. I had a vivid memory of what it looked like before the eruption, making it even more amazing to compare to the devastating images I was seeing on TV. We were planning to go on a hike to the ice caves. It was before I was married to my now-husband Rob. We also were planning to go with two friends of ours. Rob called and asked if I had heard that Mount St. Helens had blown up (I didn’t have a TV, but it was on the radio). It didn’t seem real at the time. I know that sounds clichéd but at the time it seemed like the news media was exaggerating everything. That couldn’t be really happening, could it? So we decided that it wasn’t a good idea to go hiking that day, but we still went outside anyway—3 of us ended up over at my apartment. They weren’t saying right away that people should stay inside. Later that evening, it seemed, they were warning people to avoid going out in the ash. Anyway, we still went outside to investigate. You could see it in the sky that afternoon and for days afterward you had to go around wiping ash off of every surface. You could see it everywhere. Almost every summer, my father taught a summer session at UW on volcanoes and we traveled up from Colorado. Part of our summer trip up here was a stay near Mount St. Helens at Spirit Lake. It was a favorite childhood place of mine, and we continued to travel there as a family throughout my college years. I had been following the Mount St. Helens rumblings on TV. We were living in Panama and I was following this on CNN because of my childhood memories of going there. I was fascinated, glued to CNN and very upset whenever the armed forces TV service would cut away to something else. When I found out it blew up I learned it had forever changed Spirit Lake. My mother had said it was the most beautiful, perfect volcano in the world. It was all very, very sad. I was a young wife and new mother living in the town of Carnation. I had just given birth to our eldest child Carla, born April 20th 1980. The thought that the world was coming to an end crossed my mind fueled by an excess of postpartum hormones. I don’t even think we had TV at the time nor did I need one to see the monumental plume. I was able to step out into our yard and see the ash dust. I would later be given a small vile of the dust that I held onto for years. We hope to visit Mount St. Helens this summer and see how life has returned in the aftermath. I was only 3 at the time, but my mom said she went outside. We didn’t get a whole ton of ash on the ground at first, but she said it was really dark out. She said it seemed like the beginning of a snowfall, and that it was so freaky to see the sky that way. It was in the middle of a nice day and then the sky just got dark so very suddenly. She was always on the move so she didn’t spend a lot of time watching TV. So it came as a shock to see it happening in the middle of her day. She wasn’t scared, but was confused and wanted to see what was going on. I honestly don’t remember the Mount St. Helens eruption. I just remember that massive tire fire that started a few years later. I went to North Middle and we couldn’t go to school after the tire fire since the ventilation system at the school sucked in all the fumes. This entry was posted in History, Local History, Memoir & Biography, Nonfiction, Northwest History, Outdoor Activities, Science & Nature, Sports & Recreation, Travel and tagged mount st helens, personal histories, staff memoir by Carol. Bookmark the permalink.